My buddy Dave down in Austin scored us some VIP tickets to the annual Texas Monthly BBQ Fest down in Austin on Sunday, November 3rd. That's 3 years in a row for us and I can't wait! 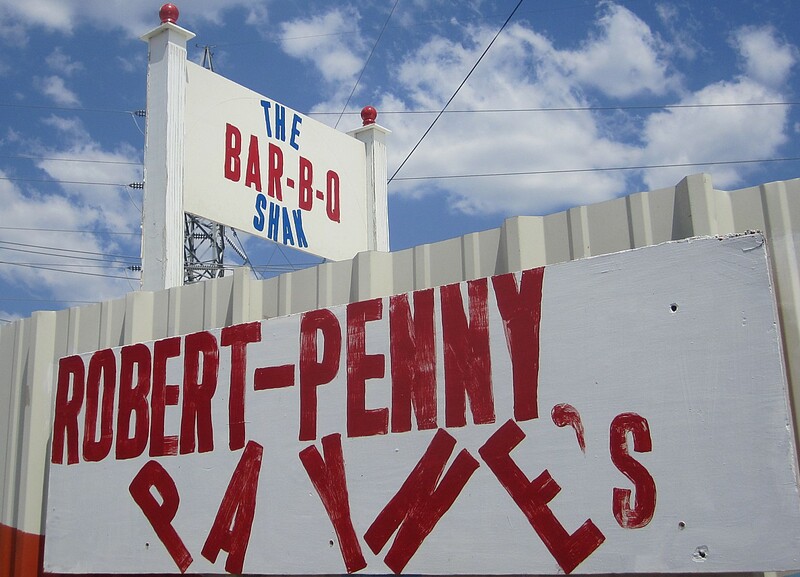 Bobby Patterson from Dallas will be one of the music performers so there will also be some good blues to enjoy. One of the best parts of our trip south on our 2013 Calories and Cholesterol Tour was the arrival of several bouncing baby Franklin BBQ briskets. Dr. Dave delivered the little bundles of joy, all the way from Austin to Lockhart. From there they rode in cooled comfort to my fridge where they sat safely until today. Ah, and now the harvest. Today I carved mine up into little dinner sized bags for the freezer where they will sit next to my frozen Kreuz jalapeno cheese sausages. I am now ready for the zombie apocalypse or any other BBQ emergency which may arise. Just call me the BBQ prepper. Thank you Dr. Dave! Drew thought I was kidding. Hah! I really do have a BBQ emergency kit. 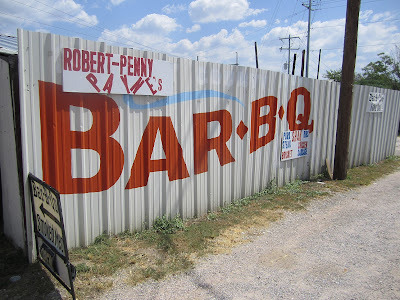 Five days, 15 BBQ joints for our latest "sort of annual" soiree into central Texas. Some places we had been before, and some new joints as well. Some great BBQ and some not so great. It was a fun trip and we came home with another 6 or 7 new places we will need to hit on the next trip! Timing is everything. 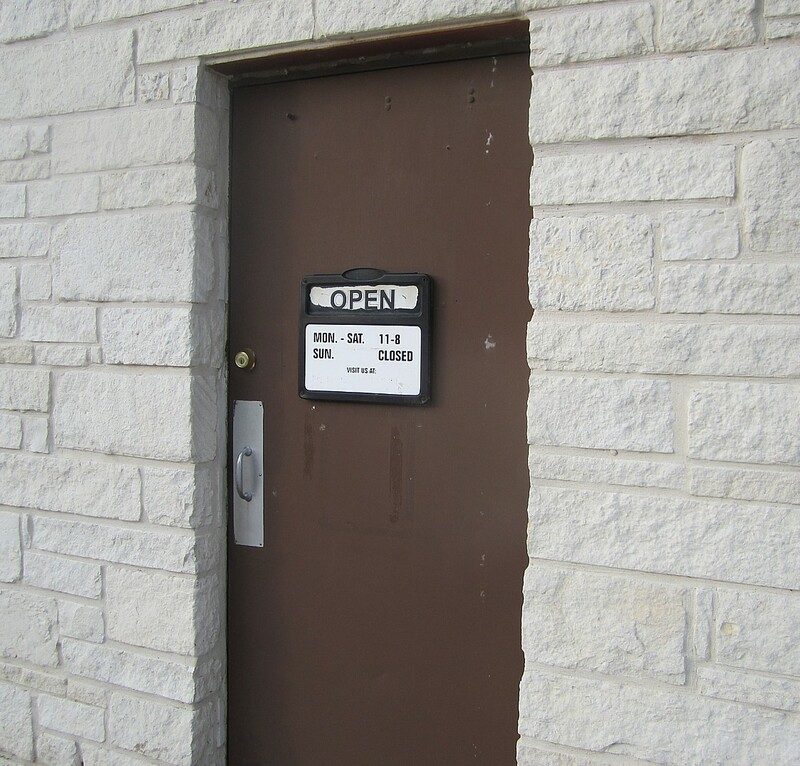 Some joints are not open Sunday, Monday, or Tuesday, even when they are supposed to be! 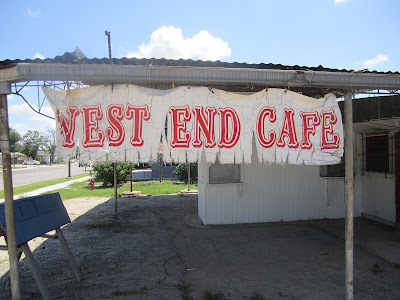 However we did make note of all the places we had to pass up and our next trip may be a Wednesday-Friday affair, just to catch those places who operate on a short week. As always, these comments represent the meal sampled on that day, at that time, and your meal may vary. 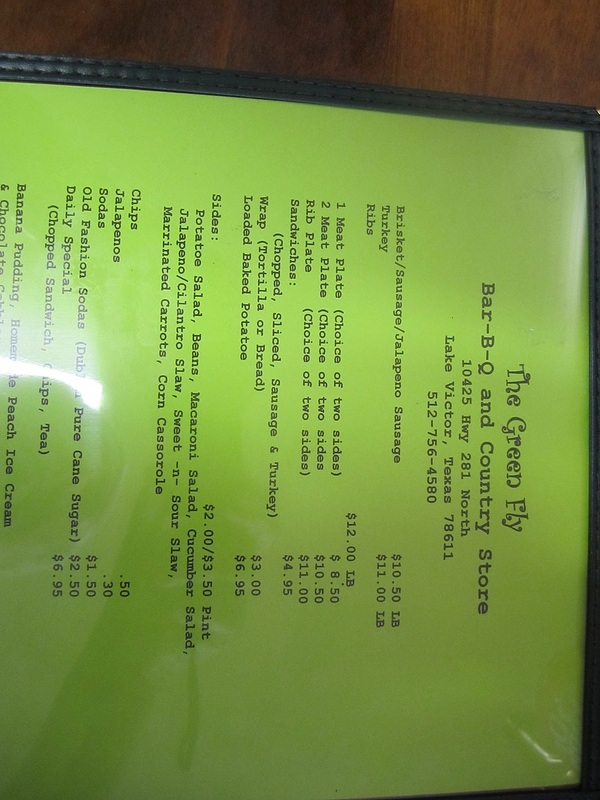 The fun part is going back to the best joints to see who delivers the most consistent greatness. 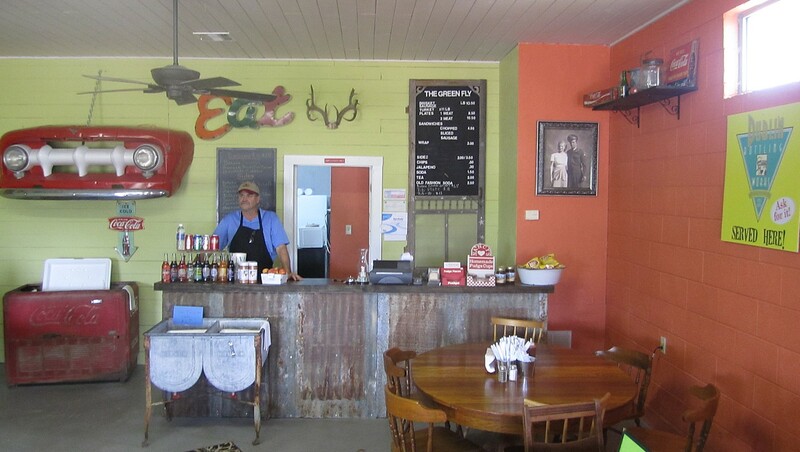 A recent first time pick to Texas Monthly's top 50, we were looking forward to stopping by to see all the changes. The Texas BBQ Posse reported on the expansion here when Miller's moved their meat processing to a new site and expanded their seating into the back. They have more than doubled their seating area and with their food they may need to grow some more. There is a nice new logo and they're even into selling t-shirts now. What hasn't changed is their excellent food. 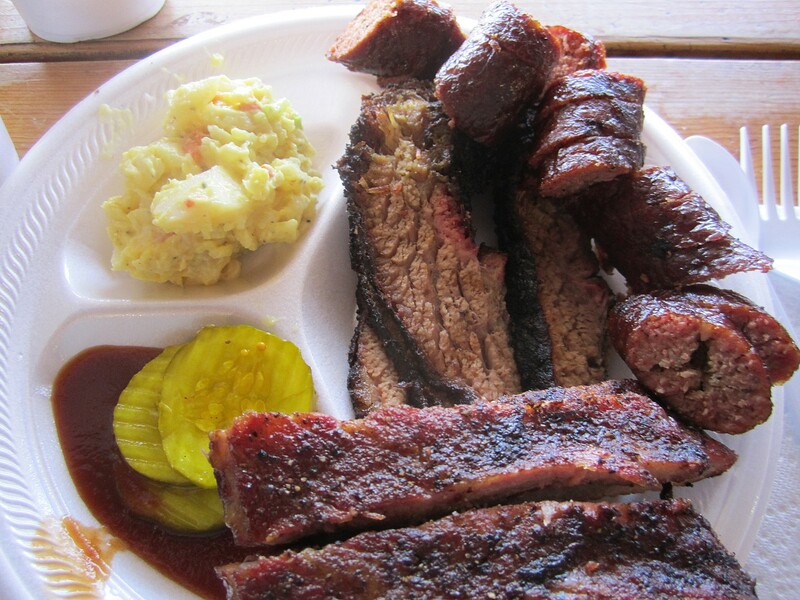 On this trip I just grabbed 2 pounds of sliced brisket to go. Also a delicious home made brownie that didn't quite make it out the door. 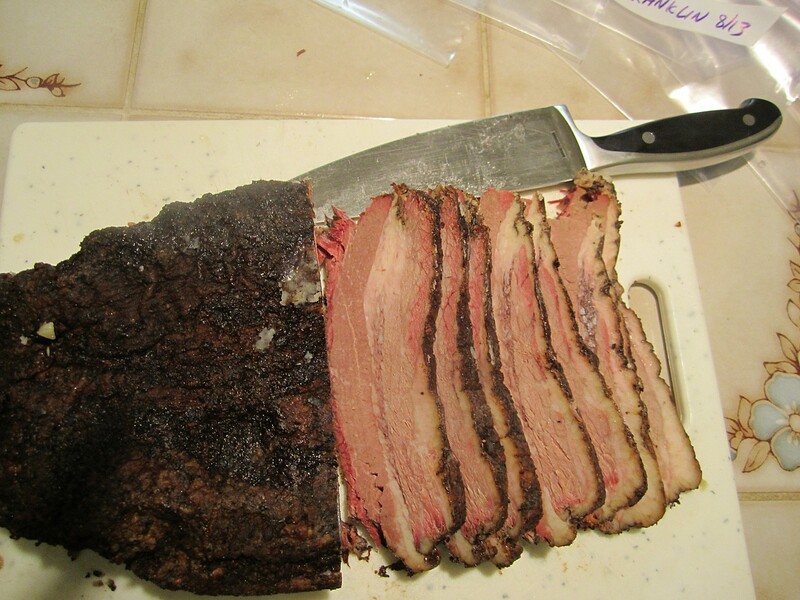 I sampled the brisket when we got home and it had excellent smoke flavor, moisture, and tenderness. My Mrs also raved on it. Top 50 indeed! Don't be fooled by the big highway signs the other place in town has on I-35. 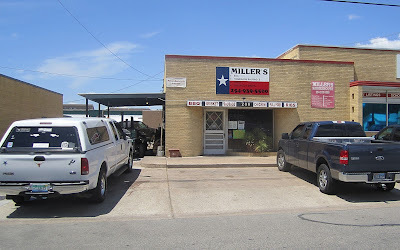 Drive right past them and turn right at the first stop sign, then look for Miller's right next to the Belton Journal. 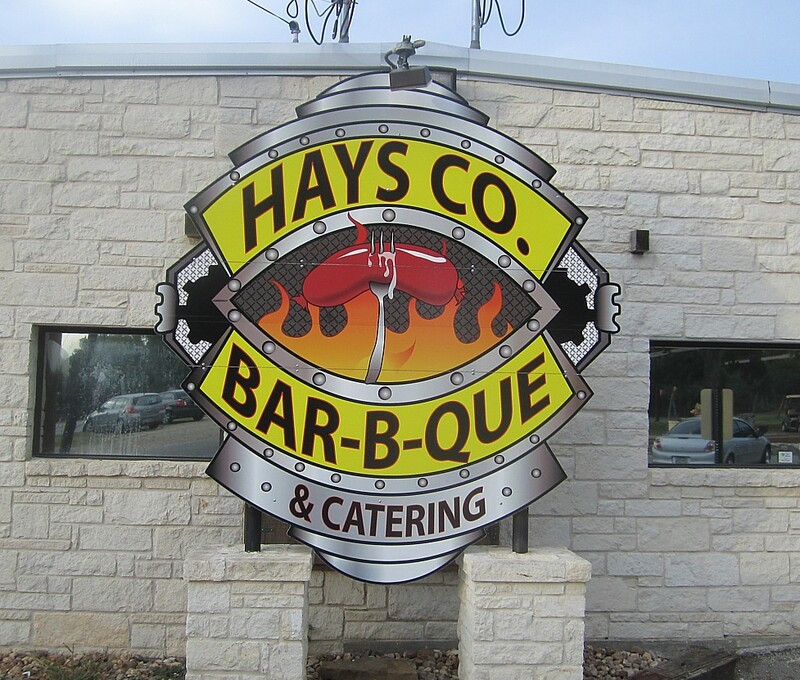 On the way into Taylor to visit Mr Vencil we spied this joint on the west side of town. 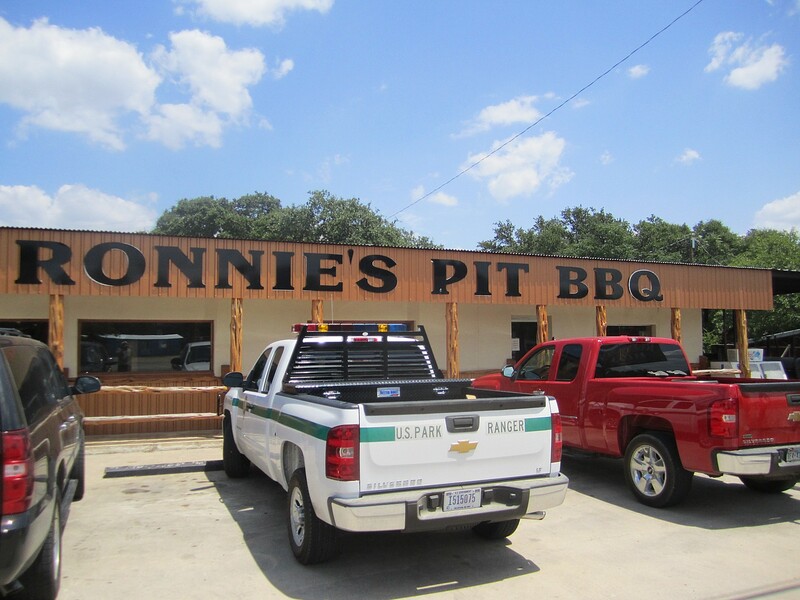 On the way back to the Pickle Parkway we stopped for a sample. There are sort of two big rooms here, one in the back with a pool table, and a small dining room up front with the counter. 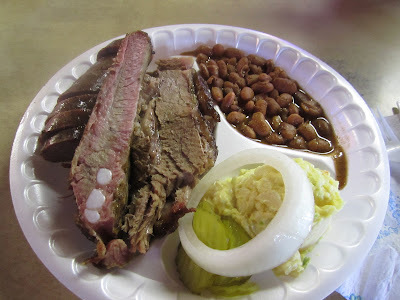 A friendly lady took our order for one plate of brisket and ribs and she offered to split our single plate for us to share. When the food arrived we had more than one plate full of food on two plates. 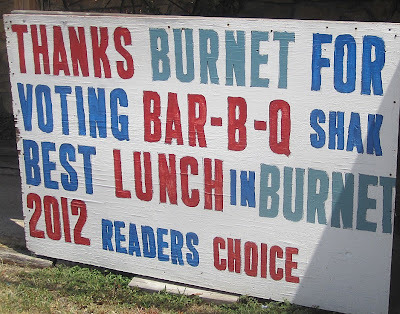 Ribs and brisket were both undercooked and more than a little chewy. There was no smoke flavor in anything. Sides were average. Another average joint with a better than average exterior. 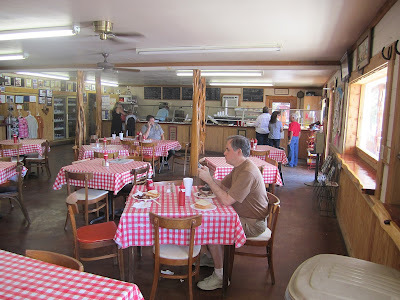 Mr Vencil Mares has been serving BBQ here since the late 40's and he was sitting at his usual place when we went back to visit on this day. 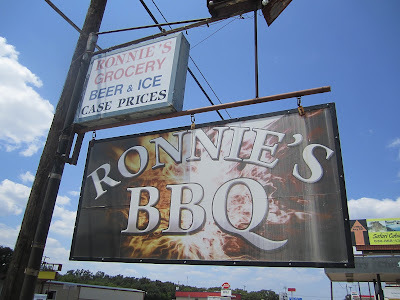 This is another spot we have visited many times before and is the site of the single best piece of brisket I have ever eaten. 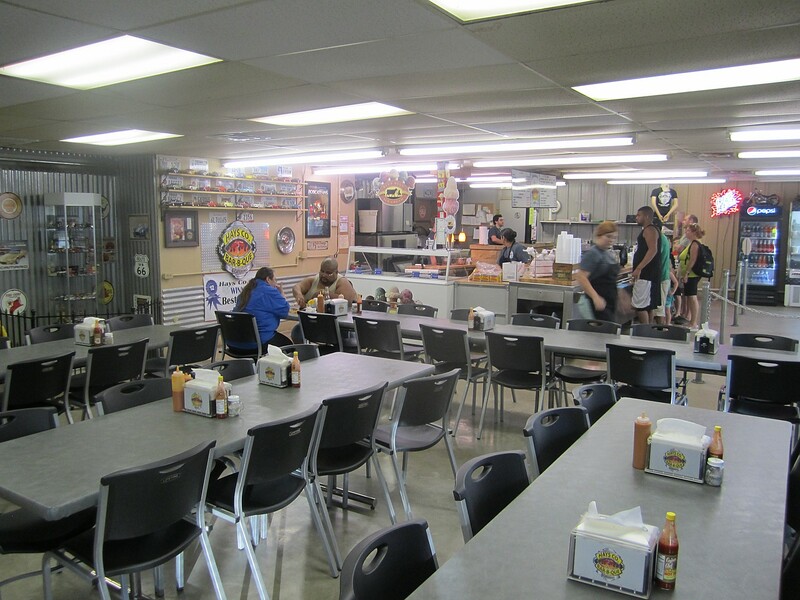 It is not a super consistent place, however anytime you can sit and visit with Mr Mares it is like visiting with true BBQ royalty. 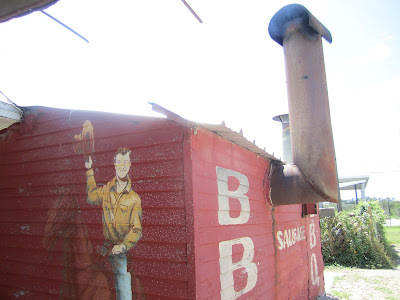 Today we talked a bit about BBQ and Mr Mares service during World War 2. The BBQ was excellent and I did not leave a smidge of my brisket, rib, or turkey sausage. Ok, maybe the rib bone. Here's a great video of Mr Vencil. 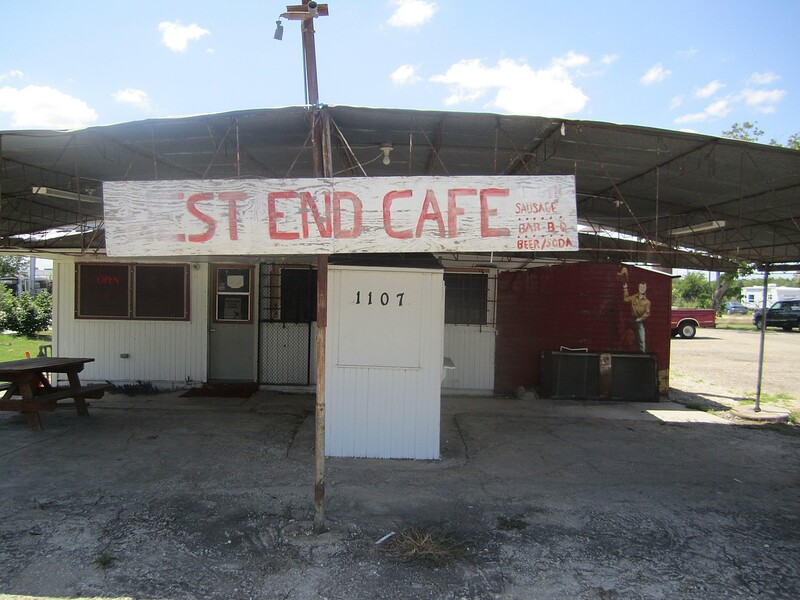 Another of our standard stops Southeast of Austin though I have to say they seem to have slipped a bit in recent samples. The ribs and sausage are still great, but the brisket does not seem to have the deep smoke flavor it used to have. 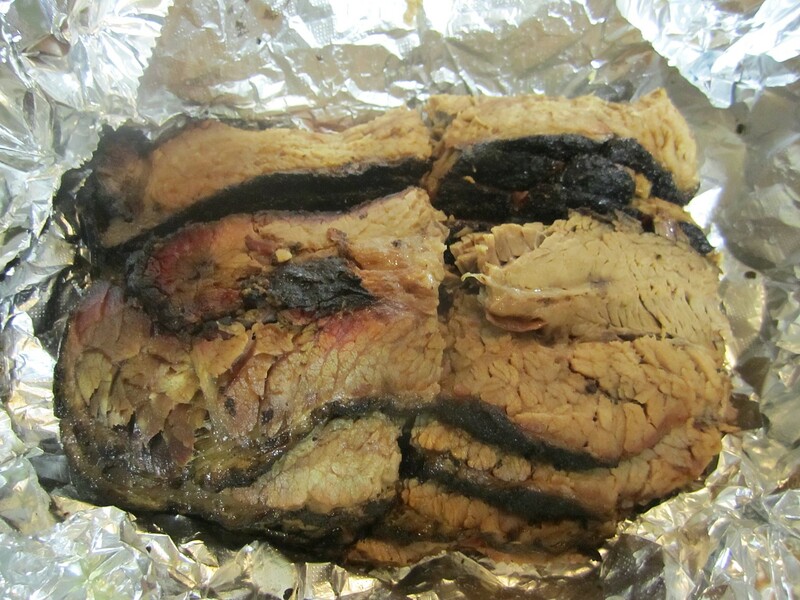 On this trip the brisket was a bit under cooked and took a little tug to pull apart. 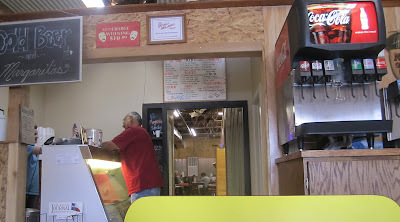 Once again, many reviews and photos from this place earlier in this blog. Take me back to Black's. 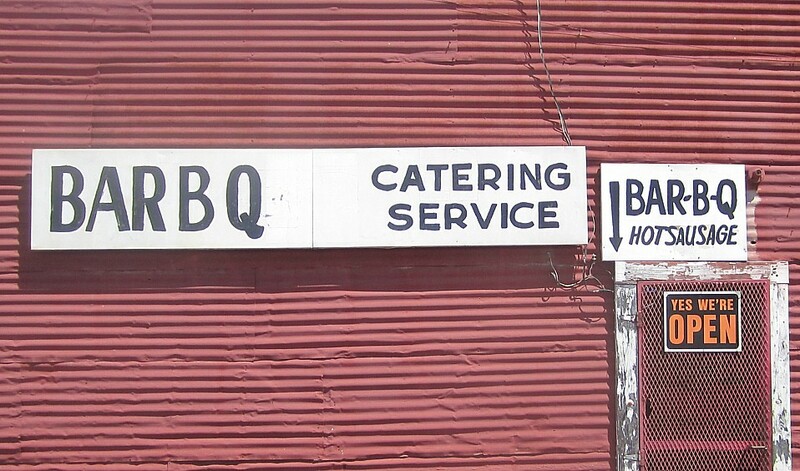 Still my favorite of all the Lockhart and Luling BBQ joints. This is one of our standard stops every time we come to the area and the food is always excellent. Perfect rib, brisket, sausage, and great sides at this meal. 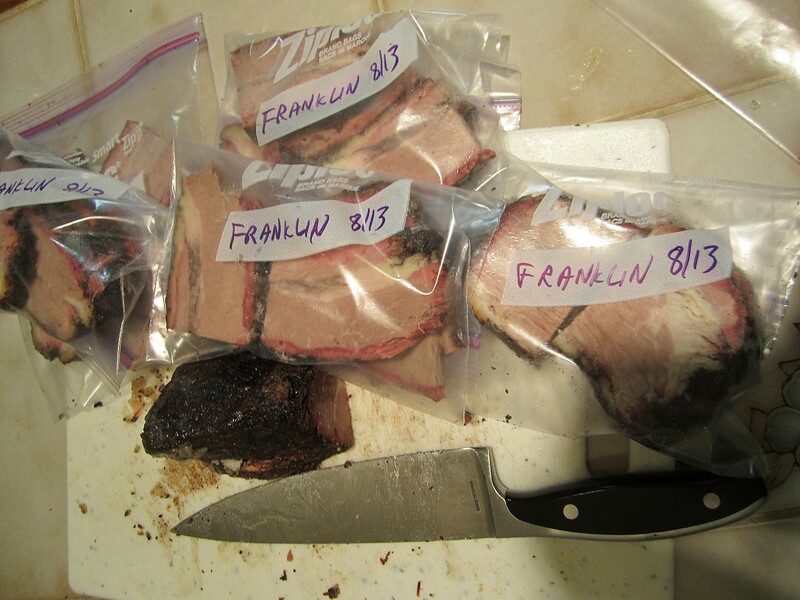 I also picked up 8 pounds of frozen brisket to go. 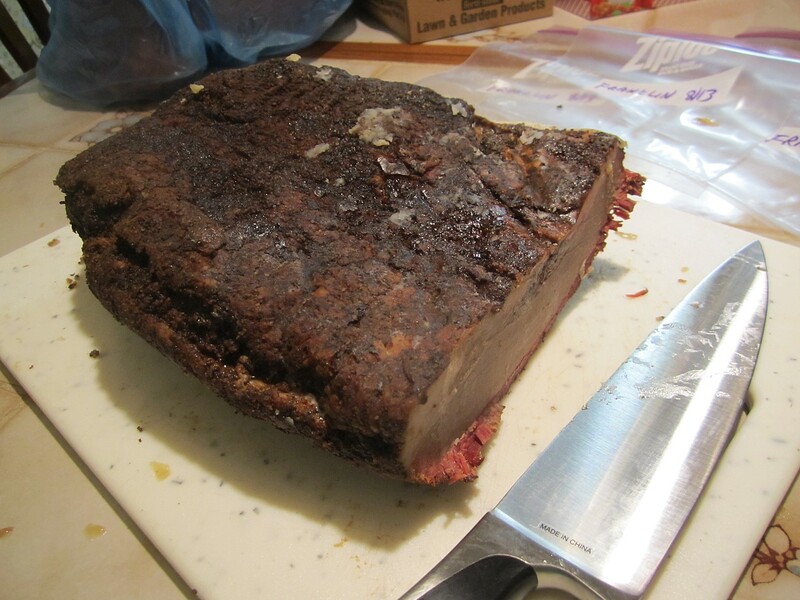 Recently, I sent 4 friends around the country a 4 pound slab of Black's frozen brisket. All were very happy. There are lots of other photos and reviews of Black's earlier in this blog. When Scott suggested this joint (a new Texas Monthly top 50) as a stop on this year's tour, I looked it up on google maps and used their street view to scope out the building. It looked really familiar, then it hit me this was Southwest Market/Woody's we had sampled back in 2007 and had really enjoyed. They have done a lot of work since then. The metal shed has been encased in stone, the dining room has been expanded into a part that was closed off on our last visit, and there are multiple catering trucks and portable pits out back. Obviously they are doing great business. 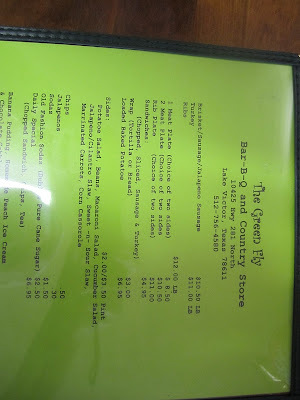 With the food they have it's not surprising. 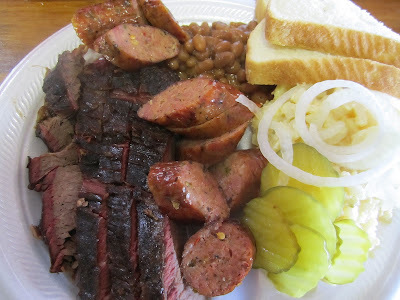 Despite 3 earlier BBQ meals, I dug into a 3 meat plate and had no problem polishing it off. The brisket was just a tad dry but the burnt ends had nice smoke flavor. 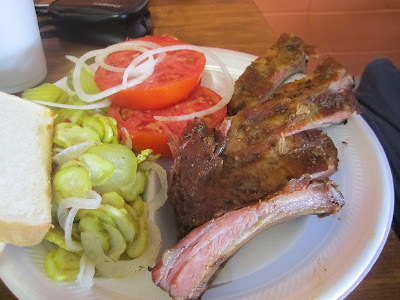 The ribs were excellent, moist, tender, and pulled away from the bone easily. The sausage was the best I had on this trip. On my first bite of their jalapeno cheese sausage I could really taste the jalapeno. Not just the heat, but the pepper itself. 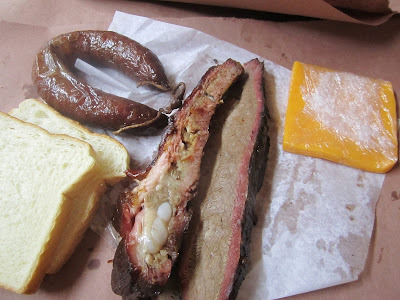 Check out the photo below to see just how chock full that sausage is of jalapeno and cheddar. Good good stuff. It was just slightly mushy, but the flavor was fantastic. The name may have changed, again, but there is still some mighty fine BBQ to eat here. 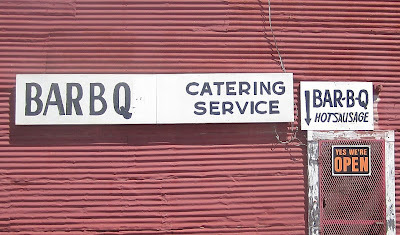 Scott did spy one leftover Woody's sign, but I kinda miss the weird fish grilling a steak sign. 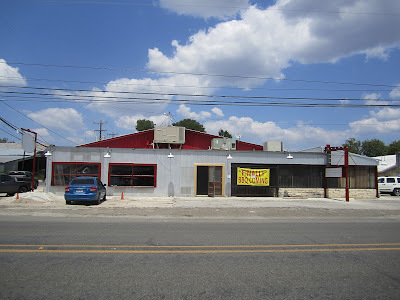 In Blanco, just east of 281 we spied this soon to be BBQ joint. 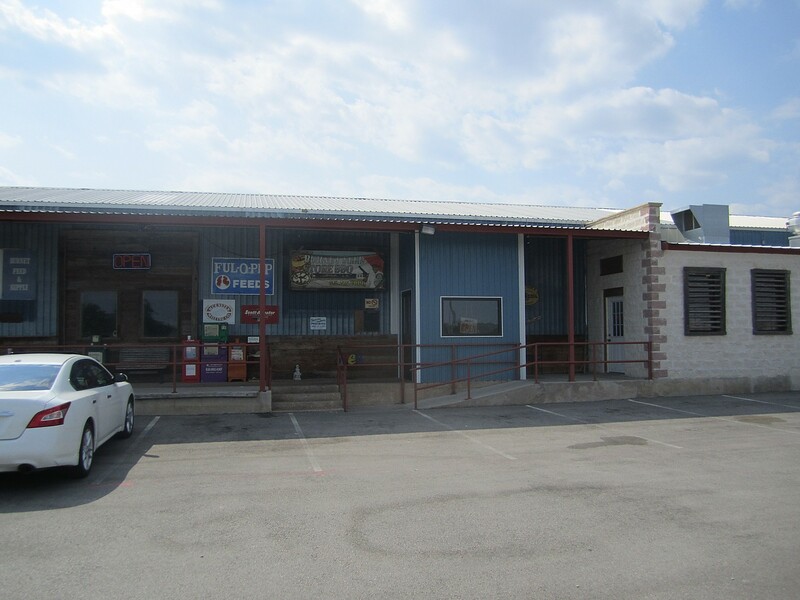 Work was under way and permits were posted. Finally indeed! Another spot we spied along the road and wheeled into on a whim. 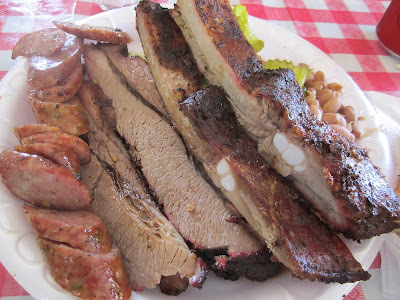 I got a 3 meat plate and split it with Scott. They were nice enough to give us an extra plate. On spotting us taking a photo of our plate, a National Park ranger stopped by to tell us that we were about to eat the best BBQ we had ever had. We smiled and chatted with him a bit, then put it to the test. The brisket was moist and tender and did well on the pull apart test. 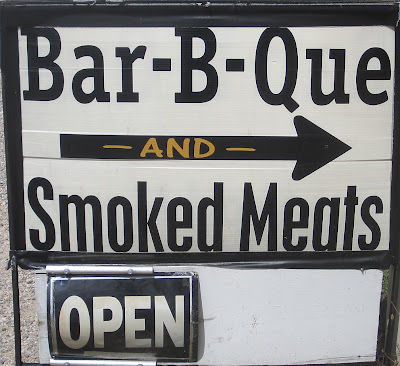 There was no smoke flavor and more of a roast beefy taste than BBQ. The ribs were a bit dry, but had nice flavor and came off the bone nicely. Sausage was average. Sides were average and that's about where we'd put this place, a good average BBQ joint. I did taste the sauce but did not write down the particulars. I just remember I did not care for it. We had planned on Peete Mesquite's in Marble Falls but they had a little sign taped to their door that said "closed today, sorry for any inconvenience." Next time. 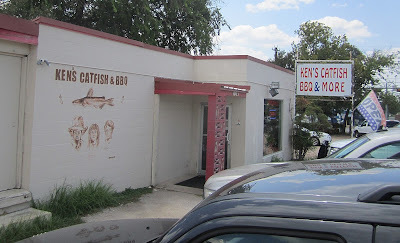 We had spotted Ken's on our previous reconnoiter so we stopped by to give it a try. The parking lot was packed, so Scott went in and got a to go box while I sat outside in the car. We had to park behind someone so I was ready to let them out. 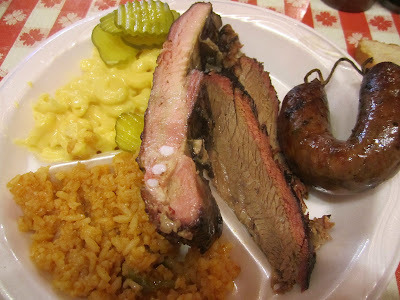 Scott came out with the pronouncement of no ribs, only brisket and sausage. 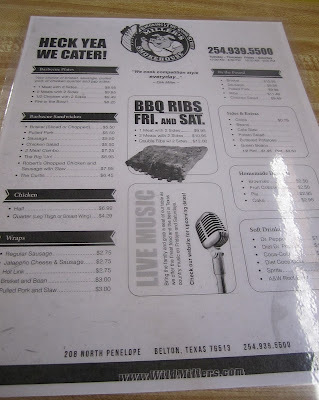 After the usual quick photos, I tasted a bit of brisket and started laughing. It was corned beef brisket. 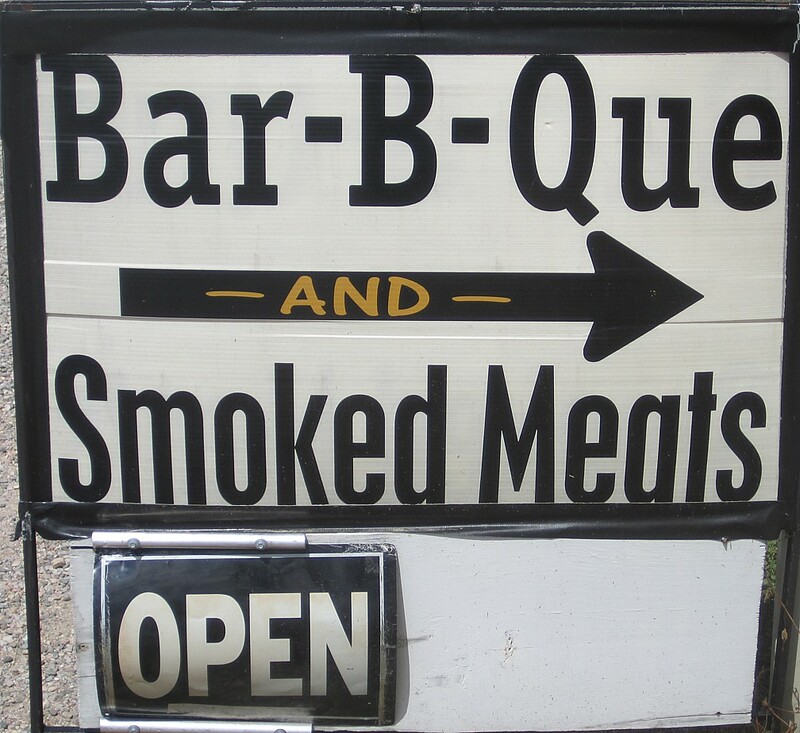 Not BBQ at all. Scott confirmed I was right and we had a good laugh. The sausage was average store stuff. Scott did say the catfish looked really good and they were obviously doing a great business. 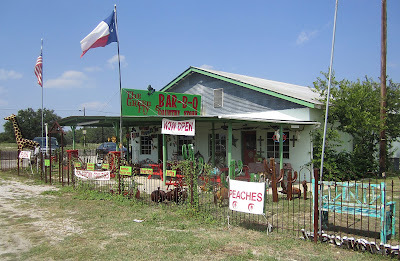 We passed this place on Monday headed to Llano and noted it for a stop on our way out on Tuesday. 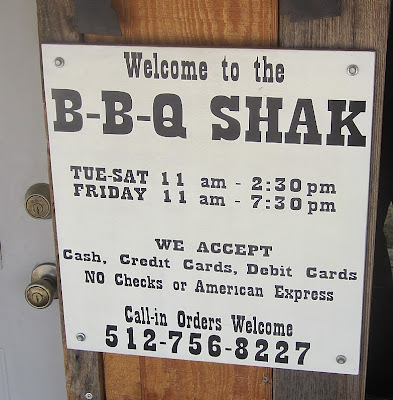 It is located just west of Burnet on 29 and is open for lunch only Wednesday through Saturday, with hours extended to 7:30 on Friday. We got there just in time to get the last parking spot. 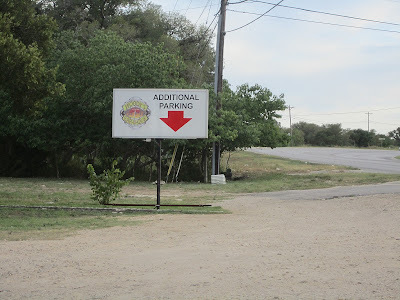 Most of the parking spots were filled with Burnet County government vehicles. Ah, another good sign! 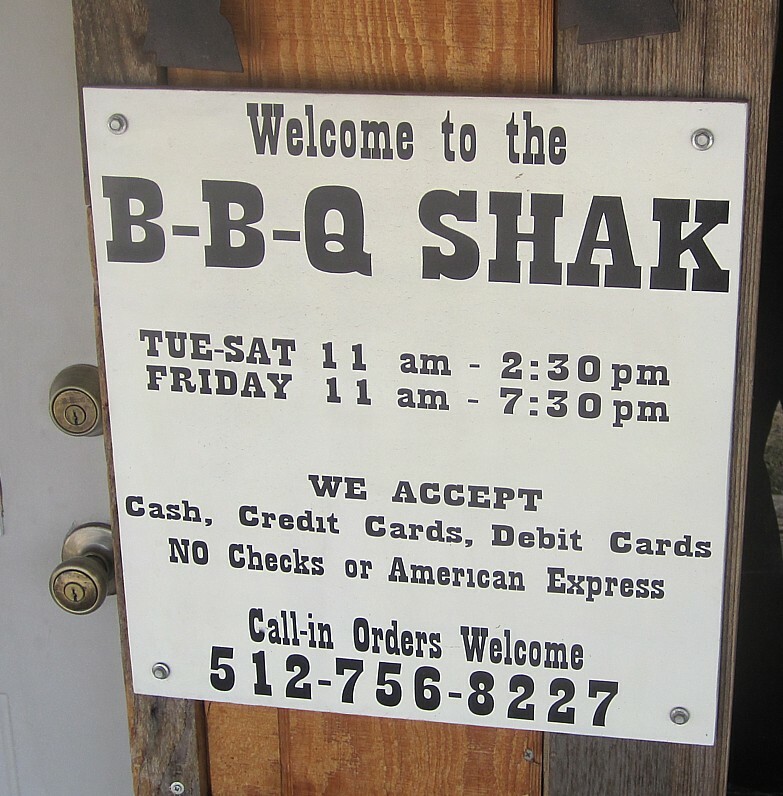 Inside we cued up in a short line where I opted for a 3 meat plate. On enquiring about jalapeno sausage, I was told, "no, but we make all our own sausage," and was then handed a sample to try. 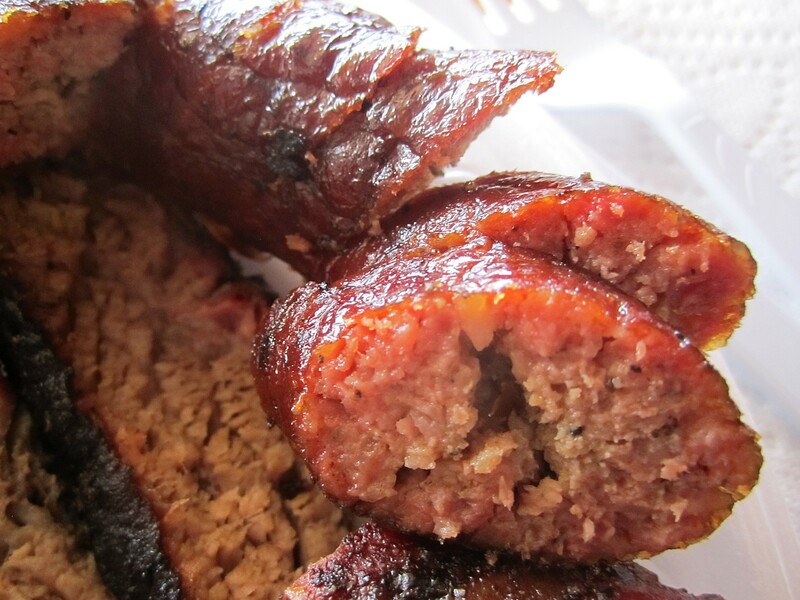 I no longer cared about jalapeno because it was some mighty fine sausage. 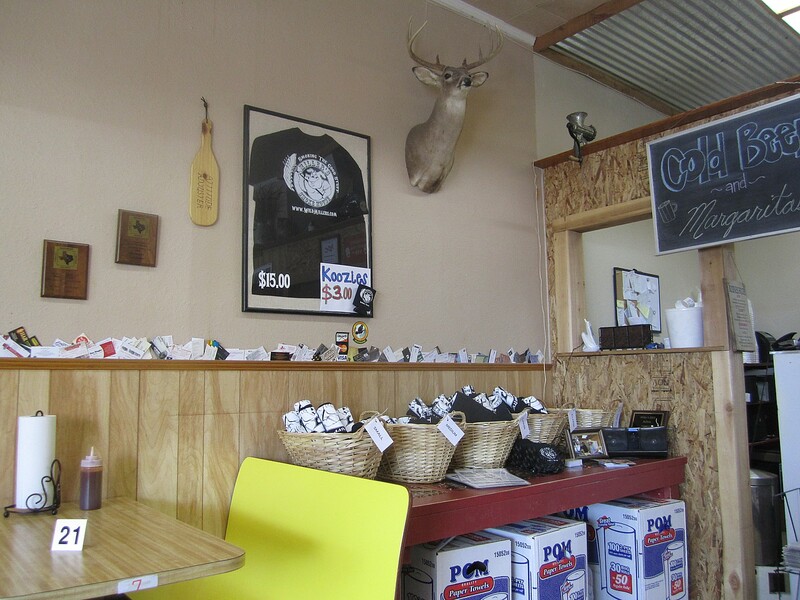 In fact, everything about this place was home made. 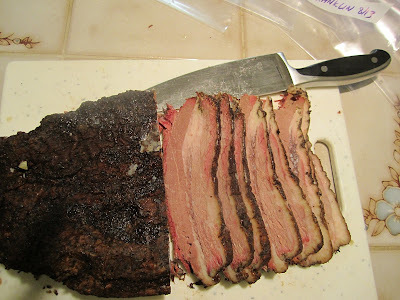 The fatty brisket was outstanding with great smoke flavor, tenderness, and moisture. The slices held together nicely when picked up, but pulled apart easily. 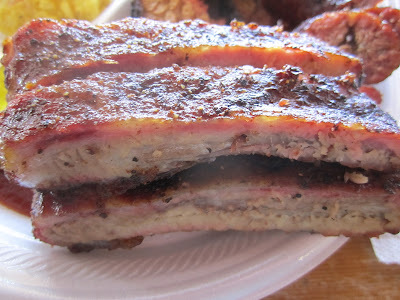 The baby back ribs had excellent flavor, tenderness, and left a perfect bite mark. 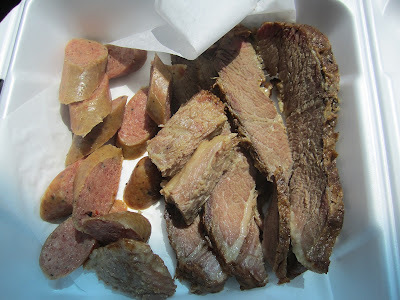 The sausage was a coarse grind mix of beef and pork with a wonderful flavor and just a hint of spicy. The moisture and casing snap were right on. The potato salad was average but certainly home made. Pinto beans were tasty and some of the best beans I had on this trip. I added a few pickles and had to save Scott's life by stealing his. They were sweet pickles with a touch of very hot spices added. Perfect for me, but they would have killed him. You're welcome Scott. 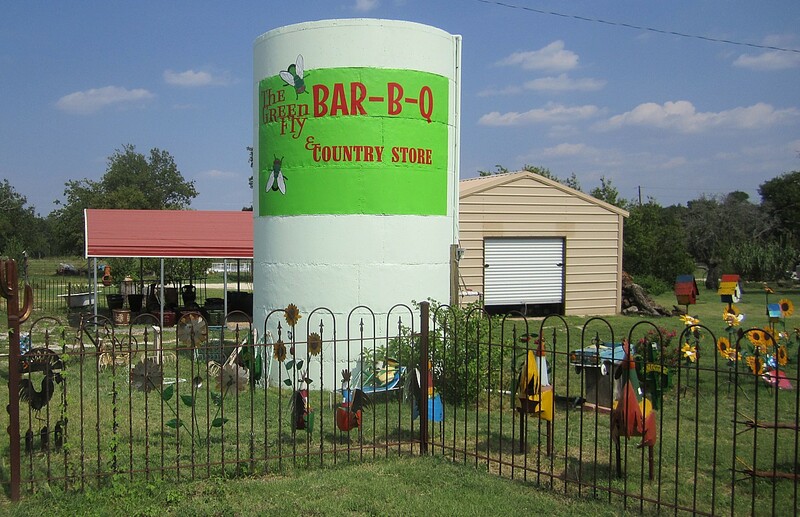 If they sold jars of those pickles I would go back just for those, but the BBQ was so good I'll be going back anyway. 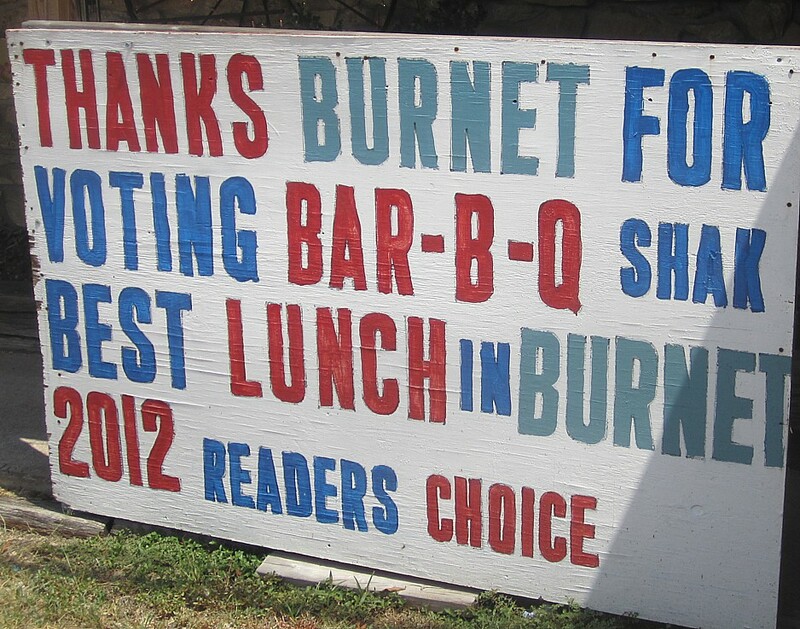 With 3 good joints in the vicinity, Burnet is becoming pretty strong in the BBQ biz. I think next time we head that way we may need to stay a night and hit all 3 places for a full meal in one day. 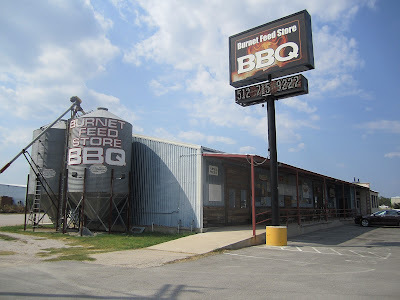 Other than a fancy new sign out front and a big metal cow and chicken flanking John Wayne inside, this place appeared pretty much the same as our last visit. 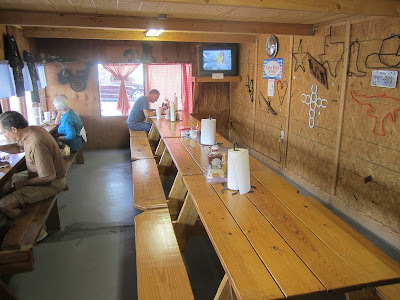 We had originally planned a full meal here since we had heard from some people that they had slipped a bit from our last visit. However running across too many new joints to try, we settled for a small snack of some brisket and ribs. 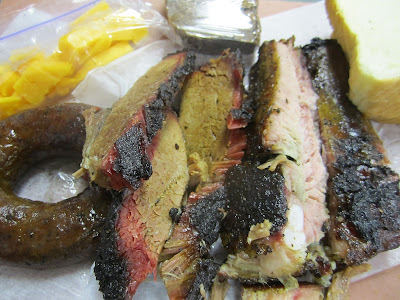 Scott had it fresh and noted the brisket was the first to have a long lasting smoke flavor that lingered. 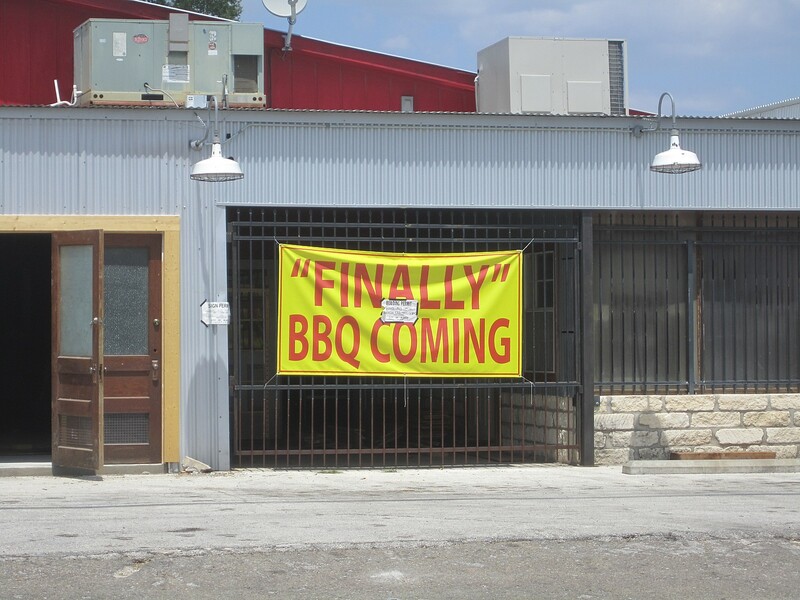 He said the rib was pretty good, too. 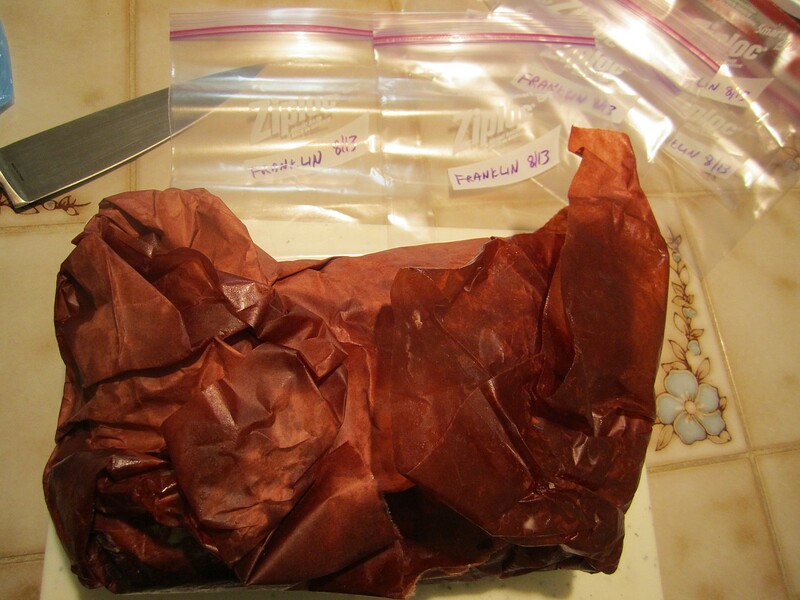 I sampled later after some time in the fridge and noted some good smoke flavor as well. So, no matter what else you may have heard, do not write this place off just yet. We will be back for a full investigation soon. We passed this joint driving down on Sunday but after 3 BBQ meals already we made a note to return the next day. 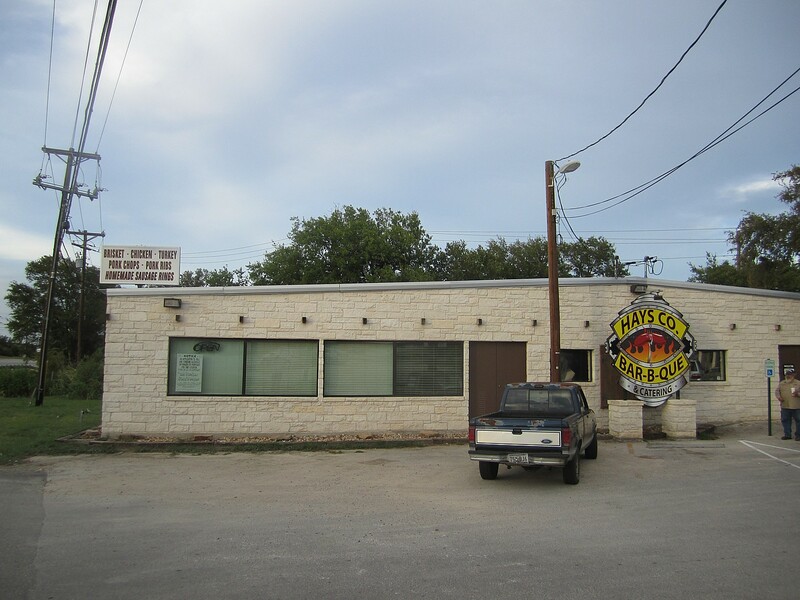 For the record, Lake Victor is about 10 miles north of Burnet on 281. Closed Tuesday. No website that I could find, but there is a Facebook page without very much on it. 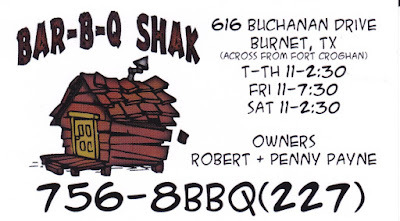 The boss man said they had been open since a little before Memorial day, so about 3 months. This is a down home country store place with a small BBQ restaurant inside. 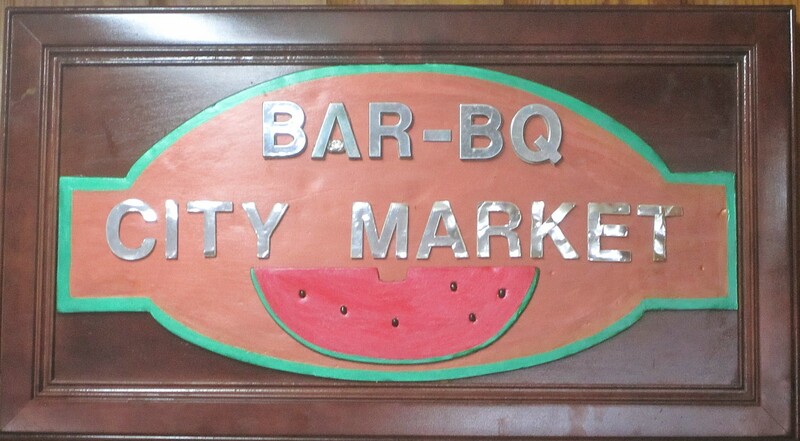 As we pulled up an officer from the county sheriff's office was leaving with some BBQ to go. Usually a good sign. 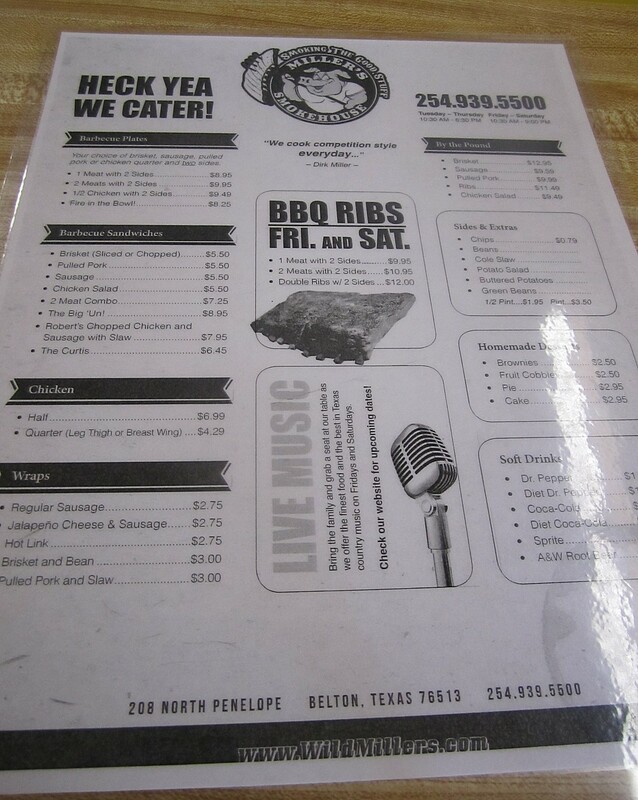 Inside we opted for a rib plate and a 2 meat plate with sausage and brisket. 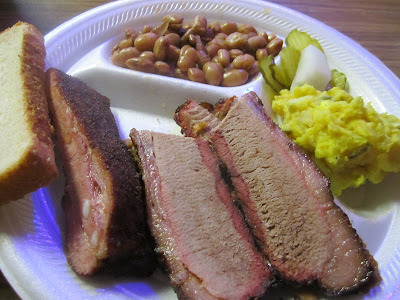 The brisket was nice and tender with good moisture and some decent smoke, mainly in the well rendered fat. It did well on the pull apart test. 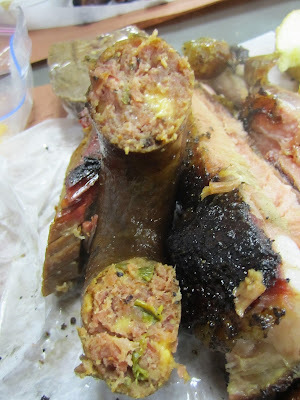 The sausage was that same average jalapeno sausage with little flavor I had the day before. 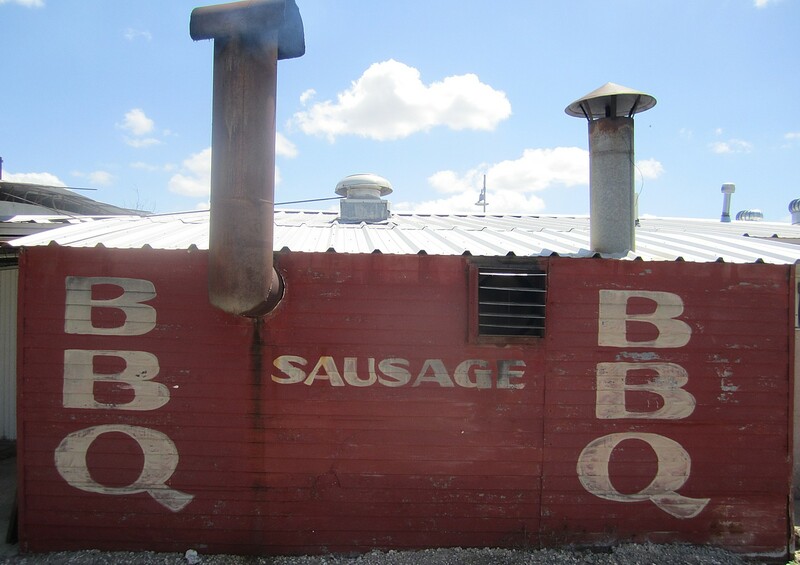 The proprietor told me he got his sausage from an outfit in Waco who delivers to many other BBQ places around central Texas. There should be warning signs. 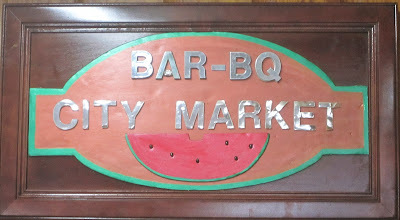 The ribs were nice baby backs with good moisture and flavor that left a good bite mark. Good ribs. I had tater salad and baked beans for sides and they were average. They had a nice selection of Dublin Bottling products for drinks. As we finished we were offered a sample of their home made peach ice cream. Honestly, I could not taste peach flavor in the ice cream, but it was a very nice vanilla flavor so I caved and got a bowl. Overall this was a good little joint and above average. Worth a stop. You can tell Scott's rib plate because of all the salad.